I haven’t been writing much on this blog lately because being in the US, many of my thoughts had been consumed by the recent election we had and I was resisting the urge to get into politics with the blog. Anything I would have wanted to write would have boiled down to “VOTE FOR THIS PERSON, NOT THAT PERSON!” And that’s not what this blog is about so I just wrote nothing. But now that the election is over, I’m returning to writing, but in a roundabout way, I still can’t completely get away from politics. But that too feels weird to me because I am about to do something that is completely out of character. So, prepare yourself, because it may never happen again. I am going to defend George W. Bush, while at the same time disagreeing with John Stewart. What-whaaaat? Yes, you read right, for the sake of this one, single, blog post, I will be taking the side of George W Bush, the president whose policies I disagree with in a very overwhelming fashion, rather than John Stewart, the political comedian who I respect and depend on daily for my news and dose of common sense and satirical take on the world we live in. And I am standing in this strange territory because today I am not writing about politics, but I am writing about art. George W Bush’s art, to be exact. “But Lee,” you might be saying, “This has nothing to do with Haiti or nonprofits, or those things that you’ve made the Green Mango all about.” Well yes, I know. But I haven’t been in Haiti for several months because my back decided to get sick and instead I’ve been spending a lot of time with American news and so at this moment this is what I want to write about, so just go with it, ok? And during this time of following American news, this past week I’ve seen a lot of George W Bush’s media tour for his new book, which has also led a lot of interviewers to dive into his latest artistic endeavors. The Today show actually took viewers into his studio for an interview and other programs such as the CBS morning show have discussed his artwork as well and what it means to him. 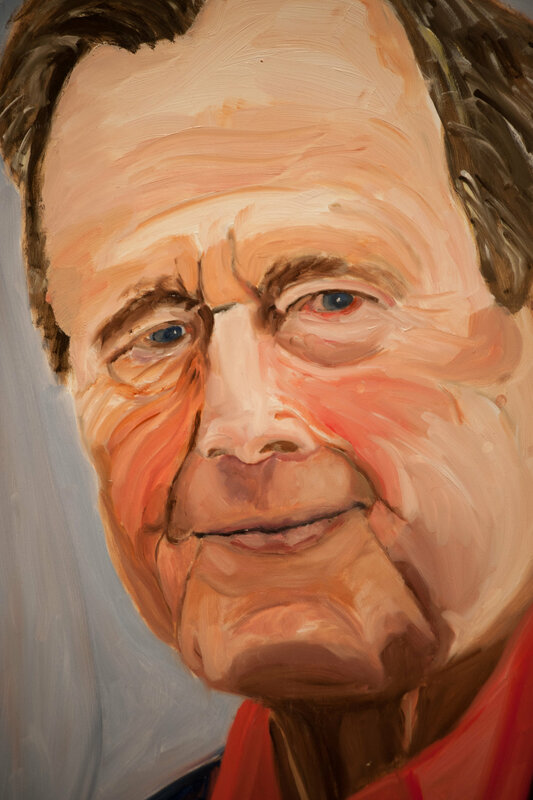 This renewed spotlight on Bush’s art has, of course, brought many critics out of the dark corners that they hide in to pounce on the opportunity for a cheap laugh by pointing out how bad his paintings really are. Some however, have taken it a step further to even insinuate that the former president’s new interest in art is actually a shameful pastime to pursue and a complete waste of time. This is where Jon Stewart decided to take his joke, as others have, but Stewart’s hurt the most to me as an artist, because he is a guy that I love so much otherwise. When asked about it he belittled Bush’s hobby by pointing out that Jimmy Carter’s “like 108 and he’s out in Africa pulling guinea worms out of children’s feet,” while George W is looking for bowls of fruit so he can paint another still life. I can forgive Stewart because he’s a comedian, not an artist, and he certainly isn’t the first person to dismiss our profession as useless. However, I wanted to make my voice heard still to say that I am proud of George W Bush for ignoring the critics and painting his little heart out anyway. I am proud that the thing that I have chosen to devote my life to is the same thing that one man has chosen to devote his time to once he was done being the most powerful man in the world. The truth is, when I saw the interior of his studio on that Today show interview, with the newly primed canvasses lying around on the floor, some with pencil sketches on them waiting for paint to be applied, others in various stages of images emerging, and realized that the man that sat in front of that easel is the same one that once sat in the oval office, I was, for the first time, a George W cheerleader. Lord knows I’ll cheer on anyone willing to pull guinea worms from kids’ feet too, but if George W chooses to sit in his studio and paint what’s on his heart, or just what’s in front of his face, then I say, more power to him! I, as an artist, embrace him and welcome him into our world. Does that mean that his art is incredible? No. He, himself, acknowledges that he’s a novice, but he’s not doing it to be the next big thing in the art world. He’s not doing it to make money; he doesn’t need to. And he’s not doing it for any grand conceptual mission. He’s just doing it to chill out and express himself. And for that I say, Amen! Sure, we could go on for days critiquing his compositions, or his proportions, or his understanding of light and value, blah, blah, blah. Although I really do have to say that I am impressed with some of his uses of color in his more recent pieces. And I can also say that if you look at all of his work you can definitely see improvement from where he started, so that makes me excited to see where he goes in the future with it all. But all of that is not the point. The point is that the man finds enjoyment in it all. And the point is that we, the American people, put him in a position for 8 years that was extremely stressful. Probably the most stressful of any job in this country. 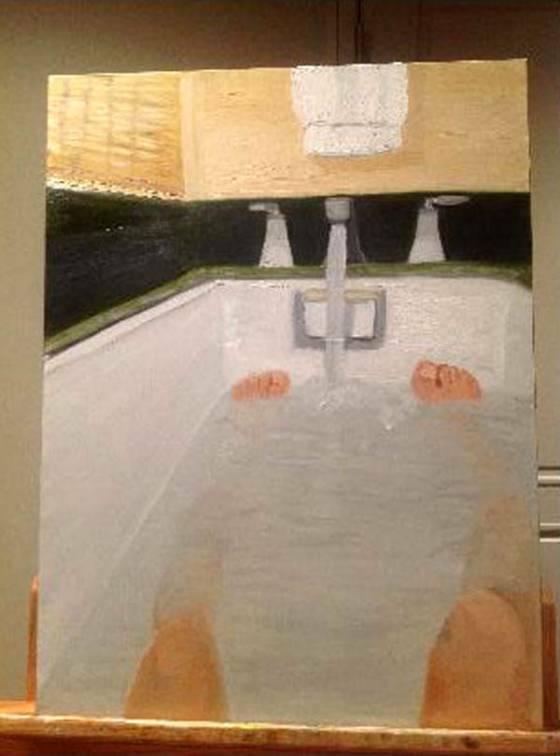 And now that he’s free from the burden of being in charge of these crazy United States, he just wants to relax and paint. And for that, I think he deserves to be encouraged. The truth is that I have spent the last 8 years in a pretty stressful position myself. (That’s right, I brought it all back to Haiti anyway. Someone give me a blogger gold star!) Not as stressful as the President of the United States, but still, pretty heavy. And so I understand the desire, once one steps out of that stress, to just want to paint. It helps, it works. It helps because there’s a lot of power in the act of painting. There’s power in the creation, in the bringing to fruition of your idea. There’s power in having control over that one thing that’s in front of you. But there’s also liberation and there is also peace in the process. And shouldn’t we all wish for each other to be able to find that for ourselves no matter where we might look. Whether we live at 1600 Pennsylvania Avenue or on a farm in Iowa, or a ranch in Texas, or in some shack in the mountains of Haiti.